The west coast of Scotland casts a spell on anyone with a taste for adventure, a feeling for the past or a love of the wild, uninhabited places. With tidal currents of awesome power running between fascinating patterns of islands, it is a challenging place for any type of small craft. Robin Lloyd-Jones has been exploring here in his sea kayak for more than forty years. 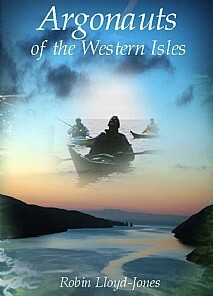 In this enhanced new edition of Argonauts of the Western Isles he takes us on many a memorable expedition to wild and beautiful shores. Amongst magnificent scenery and ever-changing seas, we are transported to Jura, Scarba, the Garvellach Isles, Mull, Staffa, the Treshnish Isles, the Monach Isles, Iona, Lewis and the Uists, Skye, the Orkneys, the Shetland Isles to places with music in their names, like Tir Nan Og the land of the ever-young, places which, once visited, become part of you. Along the way the author tells us a great deal about kayaking, about the wildlife and the history of the area but, more than that, he makes us feel that we are with him on his kayak. We experience what it is like to set out with one's destination below the horizon and nothing but open sea ahead, to bivouac under the stars, to spend the night aboard a wreck, to be 'hunted' by the vortex of the Corryvreckan whirlpool, to paddle into dark, booming caves, to feel an Atlantic swell rolling beneath the kayak and to become part of its rhythm. Through the author's vivid descriptions we know the terror of a force nine gale, the tranquillity of moonlit trips, and the lure of tiny bays and seal-meadows accessible only to a slim kayak. We encounter dolphins, otters, unidentified monsters and nuclear submarines. And when he writes of the magic of remote islands, the Robinson Crusoe in all of us is awakened. This is a book to set the imagination adrift, a book for those seeking wider horizons, be their vessel an armchair or a kayak. Sure to be of appeal to all outdoor enthusiasts, particularly kayakers; anyone with an interest in travel and adventure and with an appreciation of the natural world and environment.